Language barriers and other difficulties prevent me from discussing all the films in this edition of the San Francisco Silent Film Festival. But I will delve deep into several of them. An unprecedented number--Soft Shoes, The Other Woman's Story, The Hound of the Baskervilles, Fragment of an Empire, and the short San Francisco 1906 (as it is being called)--are restorations undertaken by SFSFF itself, in collaboration with various archives and personages holding material on these titles. This means that they will have been scanned digitally, retouched, and then put back to 35mm. Of particular local interest, the short, taken shortly after that year's earthquake, was discovered two years ago at a flea market. I have no information on the two Japanese films (An Inn in Tokyo, Policeman) or the French film (The Lighthouse Keepers) sourced from Japan, but I suspect they are all purely photochemical preservations. Nor have I managed to find anything out about Italy's Trappola. 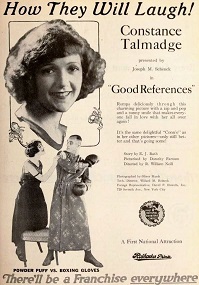 Good References is based on a nitrate print given to UCLA by Národní Filmový Archiv in the Czech Republic. As such, its intertitles had to be translated back to English by Scott MacQueen. These new title cards were produced digitally and then incorporated into the otherwise entirely photochemical preservation. With the exception of aquamarine blue night scenes, the Czech print was tinted amber. These colorations have been reproduced by traditional means--dye-bath immersion of black-and-white stock--and the print then assembled in narrative order. No Man's Gold also has a strong Czech connection. Westerns, particularly those starring Tom Mix (and his frequent Czech-American co-star Eva Novak), enjoyed immense popularity in Czechoslovakia, and Fox distributed this one there with Czech intertitles. One of these nitrate prints (perhaps uniquely) survived to be copied to a safety stock dupe negative and a print in 1993 before being discarded. Reportedly, there had been no damage to the film prior to its duplication, which preserved the entire silent frame, not just the smaller portion used for sound films. On the other hand, the lab work may not have been performed to the highest standard. Interestingly, the print is tinted by the "Prague method", whereby scenes are somehow dye-bathed without needing to be separated out from the rest of the print. 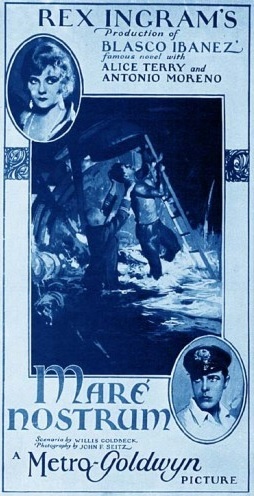 We have the good folks at Photoplay Productions to thank for the print of Rex Ingram's Mare Nostrum. Patrick Stanbury had been disappointed at the lackluster greyscale (and lack of color) of the sole extant print screened at Pordenone in 1993. Five years later he had the opportunity to have a go at making a better print, to show in Valencia along with Ingram's The Four Horsemen of the Apocalypse (previously restored by Photoplay), as both were based on the work of Vicente Blasco Ibáñez. While Turner Entertainment had an acetate negative thought to date to the 1970s, a print having belonged to Blasco Ibáñez had long since decomposed, and there was no cutting continuity indicating tinting. So while a new print (on color stock) could be made with deeper blacks to honor John Seitz's photography, the (Desmet method) tinting scheme is guesswork based on the style of Four Horsemen. Patrick also notes that, as was often the case, the film was released in several versions, and an aquarium-set romantic scene does not survive in this one. 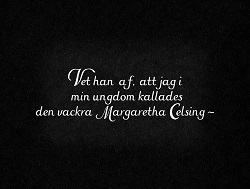 While the text of the intertitles survives in the Swedish master copy, they are not the hand-lettered and illustrated renderings originally created by Alva Lundin for the film. Only three of these cards survived on film, and an additional three are reproduced in a contemporary journal. While nearly the entire Swedish alphabet appears in these six cards in lowercase, many capitals are not represented, and those that are appear with various flourishes depending on context. A font was created in Photoshop to mimic Lundin's writing, with some capitals having a few variants and others being best guesses. Of course, there was no hope of reconstituting Lundin's charming drawings. New digital cards were then put out to film, duplicated to the correct length, and cut back into the picture. Silent shout-outs to Jillian Borders, Věroslav Hába, David Kiehn, Scott MacQueen, Patrick Stanbury, Jörgen Viman, and Todd Wiener for their fantastic assistance!